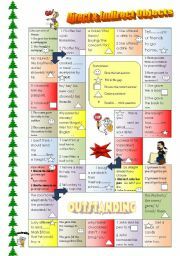 This is a board game to be used with dice and counters.It includes several types of questions including create the question, choose the correct answer, create the answer,fill in the gap, etc. 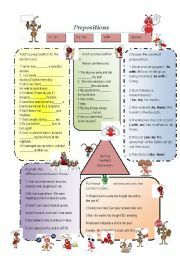 Have fun from downunder to somewhere else in ESL Printables land. EDITABLE Prints B&W easily. Preview is weird but downloads into A4 format with no problems. 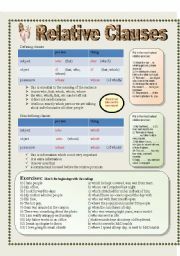 This is an explanation of relative clauses with an extremely useful chart. There are two sets of exercises for practice. 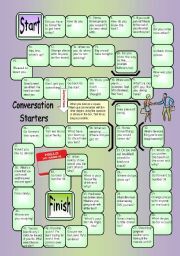 The next part, a communication bingo-type activity, is a fun way of producing and practising these clauses naturally. My students have always enjoyed this. ANSWER KEY. EDITABLE Enjoy from me downunder to you wherever. Dekky Detective has returned with another worksheet where the labels have been mixed up. Each group of sentences have the same preposition but the labels are incorrect. Students need to relabel them while associating sentences which is always a useful memory tool. 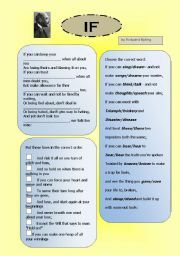 ANSWER KEY EDITABLE B/W version.Enjoy from me downunder to you wherever. A simple board game using dice (a die! )and counters. 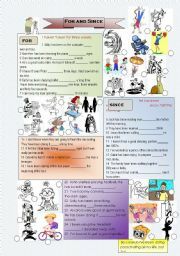 There are several types of exercises...gap- fill, sentence creation, multiple choice. Students go different paths according to certain choices. In some cases all options are correct. EDITABLE. Preview crazy again! Good luck from downunder. 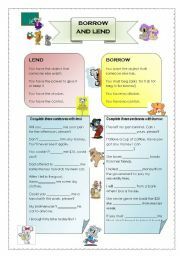 Just a bunch of koalas to help your students remember "lend and borrow". It includes sentences and dialogues to complete. The dialogues can be used for speaking practice also. Finally there are some sayings using "lend" and " borrow" to explore. From downunder to you!!!! Enjoy ANSWER KEY included. 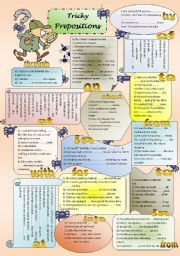 Prepositions!!! My students hate them but they know they are necessary. 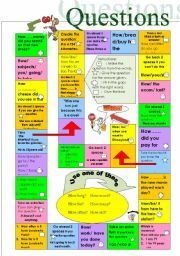 I made this simple worksheet and jazzed it up with some ants just to give it a twist.I have included a b&w version and, of course, the ANSWER KEY Yay! I love to think that a worksheet from down-under is being used in another continent. Amazing!!! Enjoy! 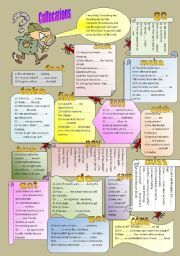 Everything you wanted to know about relative clauses and was afraid to ask! This is a very old Irish saying which I have converted into a powerpoint to be used when looking at �either/or� Even if you don�t use it in class it�s a fun philosophy for life. There are some exercises at the end (Pg 11 not in preview.) EDITABLE. Enjoy from downunder. The Best jokes use Homonyms! A power point explaining when some linking words can be used. My students felt it helped a lot. This is an email that has done the rounds. I created a power point from it and use it as a fun reading. It challenges the students and helps them to appreciate that there can be several meanings to one word.